I can’t help it. I love to tinker so much I end up a little sacrilegious in the kitchen (but still strictly kosher, don’t worry). Even more egregious this time is that it happened in my grandmother’s kitchen, the same grandmother whose traditional potato latkes I would rapturously devour every Chanukah. It’s true I abandoned the potatoes, but after reviewing a little latke history, you’ll see that my cauliflower, sumac, and aged salami latkes with honey-truffle aioli aren’t so sacrilegious, after all. The dishes traditional to Chanukah are either fried or dairy. Fried because of the miracle of one small cruse of olive oil burning for eight nights at the re-dedication of the Holy Temple after the victorious Maccabean revolt against the oppressive Greeks. Dairy because of the earlier legend of Judith assassinating the Assyrian general Holofernes after plying him with wine and cheese, allowing the Jewish forces to defeat the now-leaderless Assyrian army in the period leading up to the events of Chanukah. Potatoes became the ingredient of choice for Ashkenazim in 19th century Eastern Europe due to their greater availability, and for similar reasons schmaltz replaced olive oil. Israeli cuisine expanded the Chanaukah fried food canon with sufganiyot סופגניות, jelly doughnuts. Etymologically, some sources derive the Yiddish latke לאַטקע from the Old Russian oladka оладка (a pancake or fritter), a diminutive of olad’ya оладья, from the Greek eladion ελαδιον, meaning “a little oily thing” and itself deriving from elaia ἐλαία, or “olive,” which is also the source of both English words “olive” and “oil.” Not as simple as the direct connection with Russian latka (an earthenware vessel), but I like how it comes full circle back to Greeks and olive oil. In Hebrew, a latke is a leviva לביבה, originating in the story of Amnon and Tamar in Samuel II, where it refers to a heart-shaped dumpling. 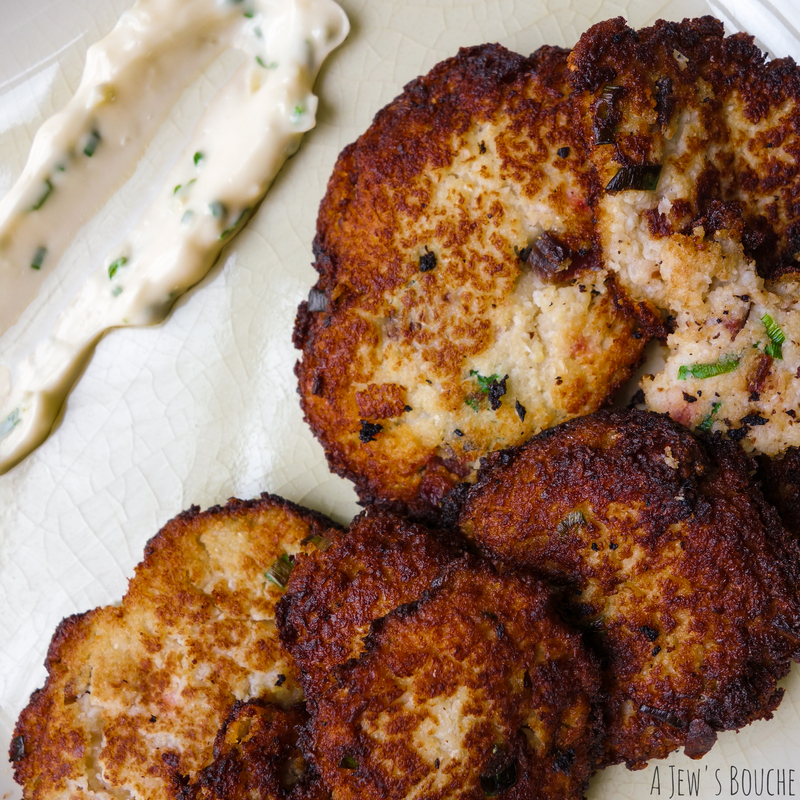 Of course, I grew up with potato latkes, and I still love them, but as my Instagram page (along with my last blog post) will attest, I’ve become enamored with finding all sorts of ways to substitute cauliflower in non-traditional applications. Cauliflower pizza, cauliflower hummus, cauliflower mashed “potatoes.” The list goes on (and keep your eyes peeled for more recipes here), so naturally, they were on my mind as I considered a little reinvention of the latke. Cauliflower is so useful because while it can take many forms in contributing (or mimicking texture, its neutral flavor makes it a blank slate, allowing you to draw from your own palette of flavors. Here I added bright, tangy sumac and chewy, savory aged salami to add a little flavor support without overwhelming. The honey-truffle aioli is sweet, deep, and bright, making the perfect complement to these light latkes. The truffle restores some of the earthiness lost in leaving out the potatoes, and the honey brings its own sweetness in the absence of onions (along with a hint of Rosh HaShanah). Well, so much for potato latkes and applesauce. At least I’m not calling them croquettes. Welcome to Modernishe Cuisine (sorry, באָבע ביילא), and Happy Chanukah! In a large bowl, beat the eggs and coconut milk and add the salt, peppers and chives. Mix in the panko and let soak for 5-10 minutes, then mix in the cauliflower and salami. Form into patties and reserve. Prepare a drying rack lined with paper towels. Heat the oil in a saucepan so that the level of oil reaches at least half the height of your latkes. Once it reaches temperature (look for shimmering oil and test with a small drop off the batter), carefully add the latkes, spaced an inch apart (you’ll probably need to work in batches). Fry for about 2-3 minutes on one side (check underneath after a couple minutes to see if the bottom is golden brown), then flip individually using tongs or a spatula. Fry the second side until golden brown. Remove latkes with a slotted spoon and let cool on paper towels. Sprinkle with additional kosher salt if desired. Combine all aioli ingredients in a small bowl and mix well. Taste and adjust seasoning. Cover and chill.